In 1927, Fritz Lang released a film in Germany that left the audiences in such future shock, they left the theaters. This film was "Metropolis". 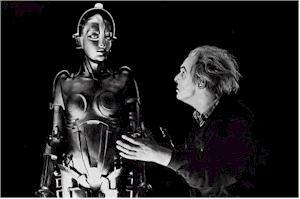 The robot, Maria, was created by Rotwang, but it was at the insistence of Joh Frederson, Master of Metropolis. She was created to be the direct likeness of Maria, one of the worker's daughters. Joh's son Feder was in love with Maria- which didn't sit too well with Joh. Phew! I hope his wife didn't look like this! This silent movie is fascinatingly eerie. Metropolis is my favorite black and white film. It is also a favorite of students of art as well as film. Fritz Lang was well ahead of his time, and possibly ours. This film shows inventions such as television, well before the fact, and many others. It is said that film maker George Lucas patterned the droid C3PO after Maria from his favorite film as a film student, Metropolis. Can you see the resemblance? In the 80's, there was a reemergence of the film, and many rock stars of the time participated in the new release which had a sound track that included Pat Benatar and Dokken, just to name a few. The film was not colorized, but given tints such as sepia and blue tones. It is safe to say that this film has developed cult following. The Masudaya company has even produced a model of Maria HERE. If you are a true robot fan, please check this film out. It is available at video rental stores, as well as Amazon Books. 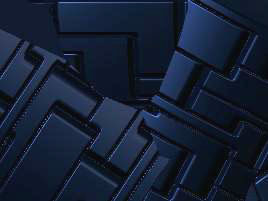 Special thanks goes to Christine Young for helping me with a few details. She has written a fantastic essay published on Flickhead. Find out more about Metropolis in a far greater depth than I can even imagine to cover on this site. Please check out her page HERE. Rome's Metropolis- Rome has done a very nice job! Metropolis Walk through- This is a very unique approach that I would have never thought of!